Sadly we have to bring you news that one of our oldest and most stalwart of members, Margaret Fox, passed away on the 11th November 2016. Margaret trained at I M Marsh during the war years when College was still privately owned and managed by Trustees. If you still have your copy of the 2010 Journal you can read Margaret’s memories of her time at College. They were difficult years and she writes at one point, “After 4 years of war, everything was in short supply. The clothing list was shortened, food was severely rationed and games equipment was almost unobtainable. A friend who had played lacrosse at school gave me her lacrosse stick and we begged clothing coupons from relatives. BUT were always hungry”. After leaving College Margaret continued her connection through the Association of Past Students, eventually serving as its President from 1973 – 1979. Even after retiring as President she continued as the Set Rep (for 1946/47&48) until quite recently. Unfortunately, as her health deteriorated she lost touch and we have only recently learned of her death. Margaret Irene Gibson was born on 9th March 1925 in Liverpool. Her mother, Emily Pickering, came from Rainhill, near Liverpool, and her father, Walter Gibson, from Manchester. Most of her childhood was spent in Dronfield, between Chesterfield and Sheffield, in a house in Stubley Lane (with her older brother, Alan), which her father initially rented and later bought. 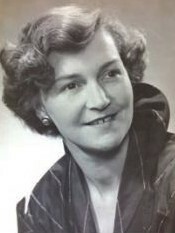 At age 10, a year early, she passed a scholarship to the local grammar school, Henry Fanshawe, gaining her school certificate and during the war going to IM Marsh College in Liverpool to train to be a PE Teacher and physiotherapist, maintaining a connection through the Old Students which she continued until very recently. She taught at New Mills Grammar School in Derbyshire and later Sheffield, developing a skill in working with children with special needs, including a spell in the School for the Blind in Sheffield. She was later to join the staff at Sheffield Training College, where she was introduced, via her soon-to-be brother-in-law, to George Morley Fox, a pharmacist. They had two children, Julie and Alistair, in 1956 and 1958. Married life started in Liverpool, and London, later in Chalfont St Peter Buckinghamshire where they lived until 1972. Margaret gained a part time job as a lecturer in Newlands Park College (latterly Buckinghamshire New University) where she focused on special education. In 1972, Morley and Margaret separated, she and the children moving to Eastbourne where she had obtained a full-time job at Chelsea College teaching health and special education and being a ‘warden’ in one of the student residencies. Later, Margaret bought a bungalow in rural Hankham, near Pevensey, where she spent most of the holidays and retirement, living alone until August of this year. She loved the garden, current affairs, and writing letters to the local paper getting many of them published, albeit many were edited which didn’t please her! After an unusually fallow period, the editor wrote to her to ask if there had been a problem and to invite her to submit more! She supported the local church (St Mary’s in Westham), attending the Mothers’ Union and regular discussion groups. She was a governor of the primary school and taught the children swimming for many years, up until she had a minor stroke in 2000. An avid member of the European Movement, an organisation supporting the development of local ties with Europe, she was their secretary for many years and participated in several trips to Europe, mainly France, which they organised. In Julie’s opinion, a clandestine socialist organisation, probably the only way to operate successfully in this very Tory blue environment! Despite Julie and Alistair’s encouragement to come back ‘up North’ she resisted, saying she wanted to stay in the warmer Sussex and in her bungalow, with its rural views. She was admitted to hospital at the end of August and in October it emerged she had Adenocarcinoma, which had blocked her oesophagus and explained why she wasn’t eating or drinking. Despite corrective treatment she never really started eating again and died peacefully in the early morning of 11th November, having seen all her close family in the previous two weeks. Finally, we would like to share with you Margaret’s news for the Journal in 2001 “In 2000 I survived a Transient Ischaemic Attack, a dislocated elbow and a Carotid Endarterectomy, so that was enough of hospital beds. A month after surgery I was back teaching swimming which helped to restore my sanity” Bear in mind that, at this point, Margaret was 75!!! Margaret will be remembered with affection.